As part of its programme to support local science and engineering projects for young people, Market Cross UK Limited has donated equipment needed for an important research project based in Dorset. The new centrifuge will enable more efficient DNA extraction and profiling of the Borrelia bacteria from ticks. The Borrelia spirochete bacteria is responsible for Lyme disease in humans which is the most common tick-borne disease in the Northern hemisphere. There are around 3000 new cases of Lyme disease each year in the UK according to Public Health England. Sixth form students at the Thomas Hardye School in Dorchester, Dorset, have been collecting ticks from around Dorset with the aim of developing a risk map of the county and a greater understanding of the epidemiology. The research, also supported by Exeter University and the Royal Society, has enabled sixth form biology students at the school to develop scientific research skills in preparation for university and a career in science, as well as being part of a significant research project that could help save lives in the county and across the UK. 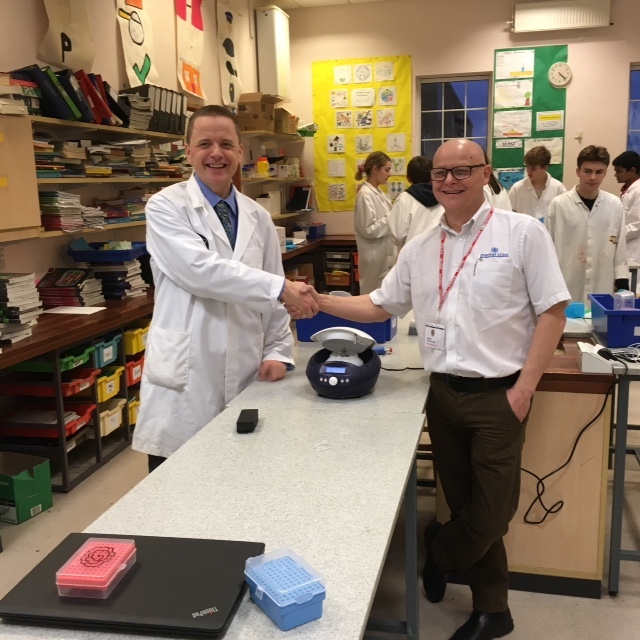 Pictured below is Michael Reed, current Chairman of Market Cross UK Limited, presenting the new centrifuge to Simon Lewis at Thomas Hardye School. Further information can be found below.